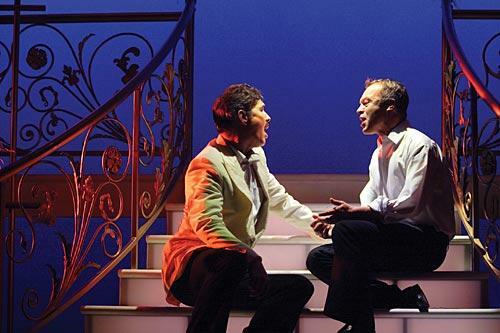 The idyllic existence of Georges (Steven Pacey) and the dazzling drag artiste Albin (Graham Norton), star of the La Cage aux Folles club, is threatened when Georges’ son Jean-Michele (Stuart Neal) announces his engagement to the daughter of a right-wing politician (Iain Mitchell), who wants to close down the local colourful nightlife! With a visit from the prospective in-laws imminent, they all decide to take drastic action to hide their lifestyle…but can they keep it up? 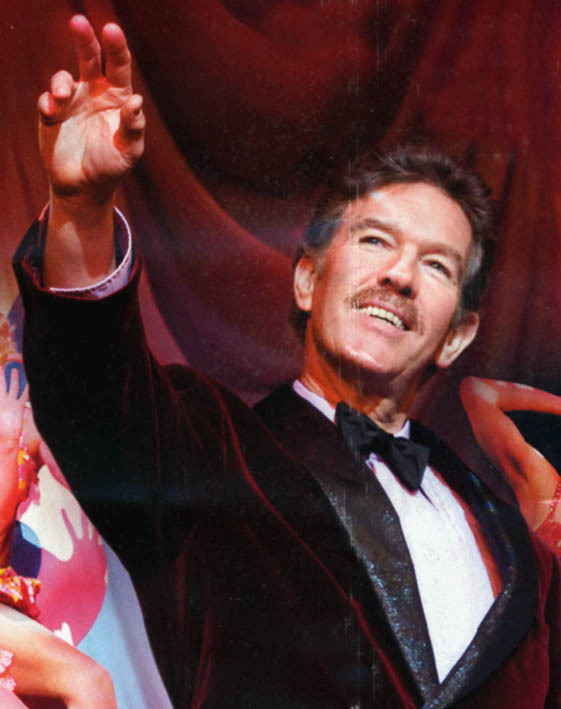 La Cage aux Folles is a timeless and deliciously funny tale of family values, unconditional love, and above all, the need to be proud of who we are. 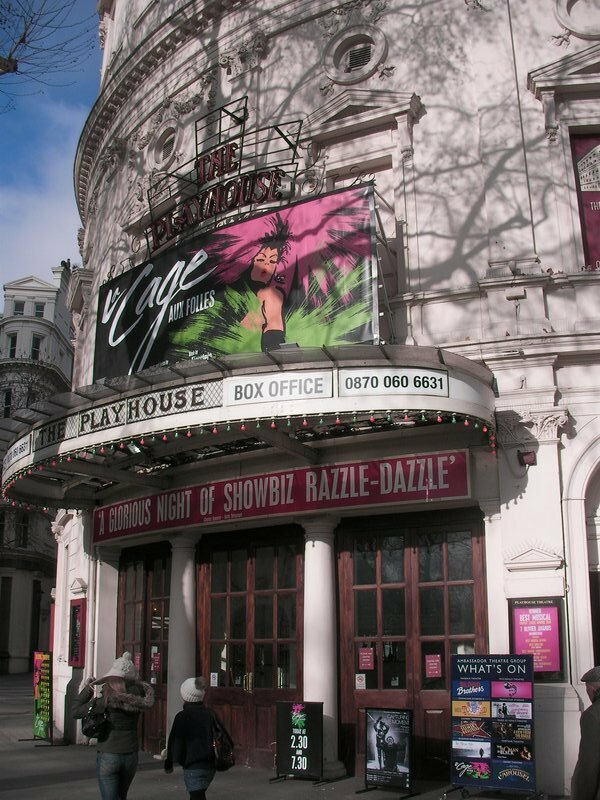 La Cage aux Folles was revived in 2008 by the Menier Chocolate Factory, and then was later transferred, on October 20, 2008, to the Playhouse Theatre. The production closed January 2, 2010. The roles of Albin and Georges have been re-cast in London every three months with well-known actors to keep the production fresh and public interest high. Television personality Graham Norton took over the role of Albin on January 19, 2009, alongside Steven Pacey as Georges. 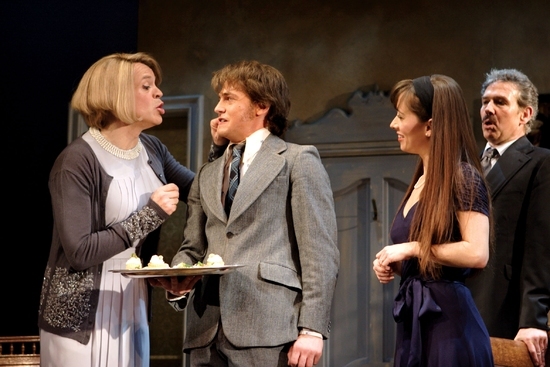 They were succeeded on May 4, 2009, by Roger Allam as Albin and Philip Quast reprising his role of Georges from the Menier Chocolate Factory. La Cage aux Folles was in 2 acts, with one interval. The performances are first class, and I would be thrilled to catch Norton, Pacey or Pennycooke in any other stage show. Please note: The terms Menier Chocolate Factory, the Playhouse Theatre, and others associated with this production, as well as all associated graphics, logos, and/or other tradermarks, tradenames or copyrights are the property of David Babani for Chocolate Factory Productions, Sonia Friedman Productions, David Ian Productions, Tulchin/Bartner, The Ambassador Theatre Group, Jamie Hendry, Matthew Mitchell and David Mirvish and are used herein for factual descriptive purposes only. We are in no way associated with or authorized by the owners and neither that entity nor any of its affiliates have licensed or endorsed us to sell tickets, goods and or services in conjunction with their events.